A beneficial bath essence with natural essential lavender and palmarosa oils, West Indian sandalwood and velerian root oil. The pure essential blend of oils calms the mind and helps to relax you after a stressful day. Hop blossom extract has a harmonizing effect to combat anxiety and nervousness. 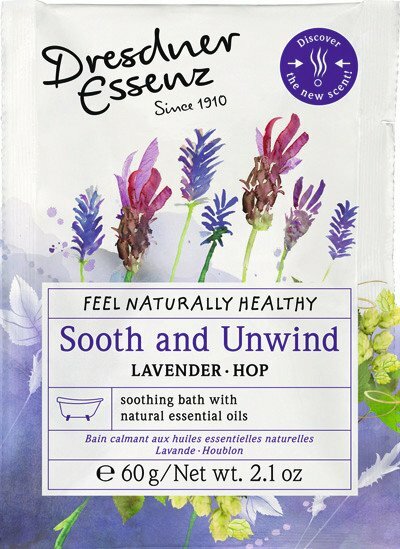 Since 1910, Dresdner Essenz has offered beneficial, nourishing products to help achieve the harmonious balance of mind, body and soul. Guided by the principals of aroma-therapy for promoting and restoring well-being using purely herbal products, great emphasis has always been placed on high-quality, natural, raw materials. Created with aromatic, premium ingredients, their luxury body care products offer the ultimate well-being bath experience. 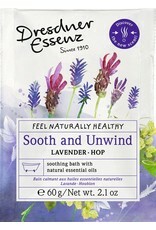 Relaxing bath with natural essential oils.